“I’ve come here to let something go,” says Heather Christian, but don’t you believe her. 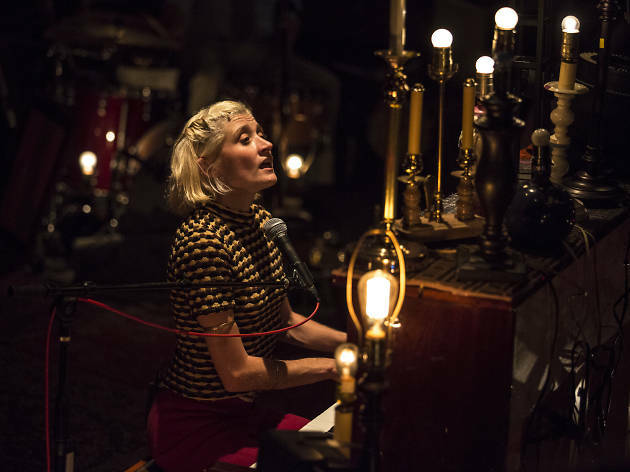 Despite her birdlike fragility, the composer-performer isn’t actually small—not if you factor in the incredible sounds she makes with her voice and the way she hammers music out of a piano. She’s also not as nervous as she lets on, though grief sometimes rises and swallows her. And although she describes her propulsive, witchy musical Animal Wisdom as a “requiem mass,” meant to lay her many ghosts to rest, Christian has no intention of parting with them. They’re in her music; if you listen, they won’t let you go either. Animal Wisdom is a Southern-style avant-cabaret séance. Christian and her bandmates gather into a circle to invoke Christian’s intensely personal—perhaps invented?—history of seeing the dead: Her first love affair was with a ghost; her granddad’s spirit is in her car. 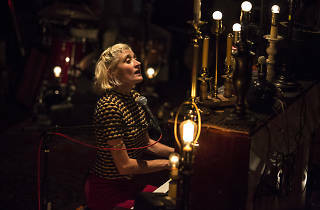 Designer Andrew Schneider and director Mark Rosenblatt surround her with a set that evokes a Mississippi junk shop; flickering light bulbs pulse along with Christian’s rock-folk, gospel-inflected pop hymns. It’s part concert, part painful para-autobiography and part old-fashioned magic act. This time, however, the woman onstage saws her own damned self in half. The Bushwick Starr (Off-Off Broadway). By Heather Christian. Directed by Mark Rosenblatt. With Christian. Running time: 2hrs. No intermission. Through Nov 4.